In Dragonball Xenoverse 2, you can feed Buu, for that he will give you rewards in the form of equipment and other useful items. However, first you have to find the food. In Conton-City, you can find some hidden edible food and you can collect them for the fat Buu. Through the feed supplies, you can then start a family and get more bonuses. For additional rewards, you should always provide him enough food. Besides, you can also help him to start a family. With our tips, it is quite easy to find fast and lots of food. Follow our guide and the fat man will reward you generously. - Blue lights in Conton-City will help you to recognize the corresponding items. Although the food is mostly on the ground, you can still find them easily and quickly if you have obtained a pilot license. - The food respawns when you make a quick fight or crash into one of the fast parallel quests. You can do this after you collect all the items. 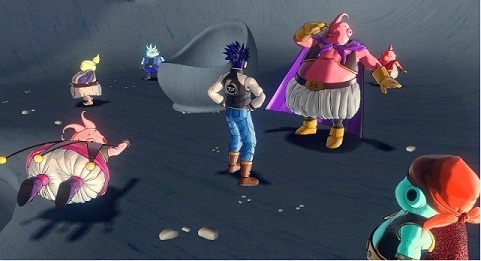 - If you have completed the Parallel Quests or a quick fight, then you can pick up all the food again and feed Majin Buu. Another alternative is when you visit NPCs as they can also leave you some food. For example Krillin entrust you with the special milk delivery mission. Otherwise, you can try your luck also with time patrollers. Once you have some food in your inventory, you should visit the fat Buu and feed him. In Majin Buu's house, you deliver the food and fill a bar in the upper right half of the screen. If this is filled, a small Majin or Buu appears. They will appear in three different colors, which have different meanings. You must also provide food for the little buus. If you do that, they will temporarily disappear and return after some time, or after a few missions, and receive rewards again. The Buu youngsters eat just about anything. Get them a pudding or a fish, give them it right away. Besides the rewards these tasks have a completely different effect. With Buu you can unlock an alternative end. For this you should feed him until he has six children. For this, he will reward you with a mysterious egg, which is needed to unlock the second ending of Dragon Ball Xenoverse 2.